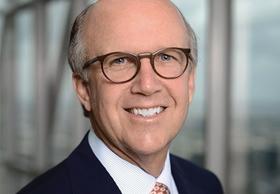 Tenet Healthcare's embattled CEO, Trevor Fetter, is stepping down in March or when a successor is appointed, the hospital chain announced Thursday. Ronald Rittenmeyer, the current independent lead director on Tenet's board, will become executive chairman effective immediately. The board has hired a search firm to find Fetter's replacement. Tenet also adopted a poison pill defense to keep an unwanted change of ownership from imperiling about $1.7 billion in tax offsets on future profits. Tenet, the nation's third-largest investor-owned hospital company, has become the target of activist hedge fund Glenview Capital Management. Glenview this month broke a yearlong standstill truce it had with Tenet not to foist outside changes on the company when two Glenview representatives on Tenet's board resigned their seats citing "irreconcilable differences" with the board and management. In the Fetter announcement Thursday, Tenet said it also plans to revamp the composition of its board "to ensure that the board has the best mix of skills and experience to maximize the future value of the company." Glenview's moves signaled that investors were losing patience in the turnaround of Tenet that Fetter was overseeing. The company posted an operating loss of $56 million in its second quarter and lower earnings and revenue guidance for 2017 on a 1.4% admissions decline in the quarter. More ominously, Tenet's free cash flow turned negative over each of the past two quarters. The poison pill, or shareholder rights plan, that Tenet announced Thursday is structured to make it more expensive for investors to acquire a controlling interest in the company. Under the plan, an investor who acquires 4.9% or more of the company's shares will trigger a provision that allows other shareholders to buy shares at a 50% discount, Tenet said. "The changes announced today will ensure Tenet remains focused on providing high quality care to patients, innovating in ways that meet the demands of today's healthcare market, and driving operational and financial performance in a manner that maximizes shareholder value," Rittenmeyer said. Tenet has an outsized debt load hamstringing available cash for changes, said Megan Neuburger, Fitch Ratings manager director. Tenet's cash flow is just slightly more than its $900 million per year debt service on debt that is 7.3 times earnings before income, taxes, depreciation and amortization. Fitch has assigned Tenet's bonds a "speculative" B rating with a stable outlook. Tenet has been selling hospitals in markets where it can't attain first or second market share to try to improve operating margins and raise cash for other purposes. Tenet is increasing its stake in ambulatory giant United Surgical Partners International as care shifts from inpatient to lower-cost outpatient settings for many procedures, said Jefferies & Co. analyst Brian Tanquilut. Tenet used $750 million generated from the sale of three Houston hospitals to pay back a loan used to raise its stake in USPI to 80%. Investors have occasionally called for Tenet to sell its Conifer Health Solutions revenue-cycle division to raise cash. But while a case can be made for that, Tenet hospitals and USPI capture patients in both an inpatient and outpatient setting and can't be easily split, Neuburger said.